When a 2013 report from the Association of American Medical Colleges revealed that more Black men applied to and attended medical school in 1978 than in 2011, Dr. Dale Okorodudu — with the help of his brother and a medical school friend — decided to post a YouTube video about the experiences of Black male physicians. The effort would eventually turn into Black Men in White Coats, an initiative with the goal to increase the number of Black men entering the medical profession through mentoring, exposure and inspiration in the form of short documentary series. Now with a Black Men In White Coats Summit scheduled this month, Okorodudu is continuing the work to increase aspiring Black male clinicians’ confidence and investing in their future success. Dr. Dale Okorodudu speaks with students. Black Men in White Coats’ website features an array of video and podcast episodes sharing the insights and advice of Black males in healthcare careers. There is a video of physician and UCLA assistant professor Dr. Stanley Frencher Jr. speaking about mentorship, stress management, his upbringing in a family of doctors and his hospital’s impact in the surrounding community. Another features resident physician Dr. Kwadwo Owusu-Akyaw speaking about his experience at Duke University Health System, the importance of giving youth opportunities and the advice he lives with from his father that “you can be unapologetically Black and be unapologetically excellent” simultaneously. “It motivates me to work hard because I know all of them have sacrificed a lot to make it in a space where so few Black men succeed,” he added. Encouraged to apply to medical school by a pre-health advisor at his undergraduate institution, Olumba hopes to make an impact through mentorship as well. Noting younger people’s tendency to communicate more frequently through social media, Okorodudu and his team make it a priority to distribute the Black Men in White Coats videos and other inspirational stories on social media platforms such as Facebook and Twitter. Similarly, the mentoring component of Black Men in White Coats — which falls under his nonprofit organization DiverseMedicine Inc. — comes in the form of a social networking model. Mentors and mentees can instant message, video chat or send direct inbox messages to each other. Curriculum for the student mentees covers topics such as what they need to know about applying to medical school, how to build relationships with professors to secure solid letters of recommendations and what they should expect to see on the MCAT. “We just make sure the mentor knows exactly what the student should be doing at that point of their career,” Okorodudu said. 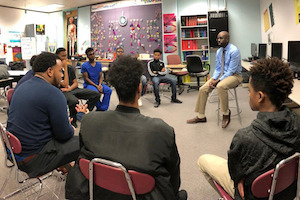 Black Men in White Coat’s impact trickles down to high school students, exposing them early on to the possibilities of a career in medicine. Dunn has already begun researching medical schools such as the University of Chicago and Johns Hopkins University in Baltimore. 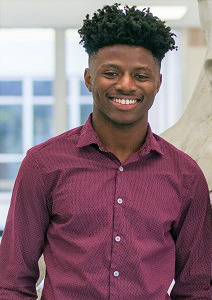 Although he has not been paired with a Black Men in White Coats mentor yet, he will have the opportunity to do so when he arrives on campus at Harding University in the fall on a full scholarship. Black Men in White Coats not only inspires Dunn, the initiative is inspiring to other students at his school as well because it gives them — even those who initially did not know much about medical careers — an opportunity to learn about and go into the field, he said. A Black Men in White Coats Summit at UT Southwestern Medical Center on Feb. 16 will bring together more than 1,400 students, parents, educators, clinicians and community leaders to increase students’ confidence and impart knowledge that they, too, can become doctors, physician assistants, physical therapists, psychiatrists or other medical professionals. One section of Okorodudu’s book How to Raise a Doctor: Wisdom from Parents Who Did It speaks to the power of setting high expectations for students. With two Black boys of his own, Okorodudu said empowering youth starts with parents and extends to their teachers, coaches and friends. “When all of those people have high expectations for your child, it’s going to cause them to rise up and perform at a higher level,” the physician said.